Who invented the Microphone? The name of the person credited with inventing the Microphone is Emile Berliner (1851 - 1929). 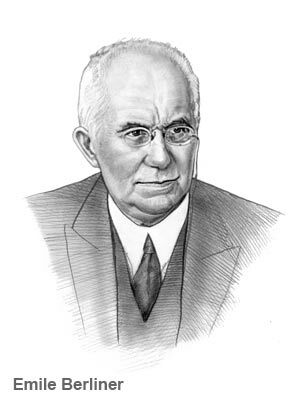 Emile Berliner is not only famous as the German-American inventor of the Microphone and the gramophone but also as a designer, researcher and businessman. When was the Microphone invented? Emile Berliner invented the Microphone in 1876, during the Second US Industrial Revolution / Victorian period of invention (1850 - 1914). Definition of the Microphone: The Microphone is defined as an instrument for intensifying and making audible weak sounds, converting acoustic power into electric power. It produces its effects by converting sound waves into an electric current and fed into an amplifier or a broadcast transmitter. Fact 1: Who invented the Microphone? The Microphone was invented by Emile Berliner in 1876 during the Second US Industrial Revolution era of inventions (1850 - 1914). Fact 2: Who invented the Microphone? The motivation which led Emile Berliner to the invent the microphone was the invention of the telephone. Fact 3: Who invented the Microphone? The Telephone was invented by Alexander Graham Bell in 1876 but produced terrible sounds and would have not have been capable of surmounting great distances without the invention of the microphone. Fact 4: Who invented the Microphone? The inventor of the Microphone, Emile Berliner, was born on May 20, 1851 in Hanover, Germany, became a United States citizen in 1881. and died on August 3, 1929. Fact 5: Who invented the Microphone? The early years of Emile Berliner were spent in Hanover, Germany where he was raised by his family and received a good but basic schooling. Fact 6: Who invented the Microphone? Following his education he left Germany and immigrated to the United States in 1870. He worked as a humble shop assistant but then got a job as a cleaner in laboratory of Constantine Fahlberg, who later went on to invent saccharine. Fact 7: Who invented the Microphone? Working in Fahlberg's laboratory he became fascinated by science and inventions. He realized that he had to learn more and furthered his education at a night school, avidly reading textbooks on physics and scientific experiments. Fact 8: Who invented the Microphone? Emile Berliner was inspired by the many inventions of the Industrial Revolution and in 1889 attended the Washington Centennial Celebration in New York City and was able to see the Alexander Graham Bell telephone. Fact 9: Who invented the Microphone? Although amazed at the invention of the telephone, and inspired by its potential, Emile Berliner realized that the telephone had adequate sound receivers if they had a strong enough signal but that they were poor transmitters of sound. Fact 10: Who invented the Microphone? Despite his basic knowledge of physics Emile Berliner was convinced he could improve the transmitter. Fact 11: Who invented the Microphone? Emile Berliner designed a "loose-contact" carbon microphone, then called a transmitter, which increased the sound volume and therefore extended the range over which a telephone could work. Fact 12: Who invented the Microphone? Emile Berliner's carbon microphone consisted of two metal plates separated by granules of carbon. One of the metal plates faced outward and acted as a diaphragm. When sound waves struck the plate, the pressure on the carbon granules changed, which in turn changed the electrical resistance between the two metal plates. Fact 13: Who invented the Microphone? Emile Berliner filed for a patent on 4 June 1877 for his carbon microphone. However, Thomas Edison had separately applied for a patent for his carbon diaphragm microphone in March 1877 that resulted in the two men fighting a long legal battle over the patent rights. Fact 14: Who invented the Microphone? Emile Berliner finally got his patent in 1891 and Thomas Edison received his in 1892. The Bell Telephone Company, founded by Alexander Graham Bell, bought Berliner's microphone patent for $50,000. Fact 15: Who invented the Microphone? Emile Berliner began working alongside Thomas Watson (1854 - 1934) to address other problems relating to the telephone. Emile Berliner introduced the induction coil that greatly increased the voltage out of the transmitter which, in turn, increased the range of the telephone. Fact 16: Who invented the Microphone? In the late 1893 the U.S. Attorney General started a case against Emile Berliner and the American Bell company over the patent. The case was politically motivated by the commercial enemies of the Bell company and the court found in favor of Thomas Edison. Fact 17: Who invented the Microphone? In 1894 Emile Berliner resigned from the Bell Telephone Company in order to begin work on sound recording and reproduction. He went on to develop his most famous invention of the Gramophone. Fact 18: Who invented the Microphone? Emile Berliner died on August 3, 1929 but his name will be remembered as the inventor of the Microphone and the Gramophone.